This ULTRA low profile screening system with completely hidden fasteners is perfect for higher elevations and various second story applications. MINI Track 3/4" x 3/4" channels and clips work well with any housing style and trend, blending in without obstructions to create a clean, seamless look. MINI Track channels come in 8' length. This easy 2 part aluminum screening system is truly unique. 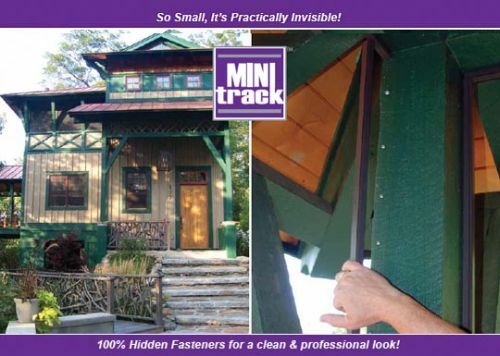 MINI Track has 100% Hidden Fasteners for a clean & professional look! So Small, It's Practically Invisible! Now MINItrack Channel pieces should be cut to desired lengths. Install the left & right channel vertical's by just "snapping" them over clips directly attached to the frame using a rubber mallet. Now using the spline, Rollerknife™ Screening Tool & screen mesh material, simply roll the spline into the groove of the MINItrack channel to hold in the fabric. Starting with the top, working your way to the sides and bottom of each section to be screened. Simply trim off the excess screen mesh and you're done!